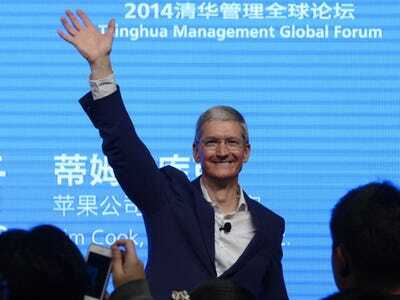 REUTERS/China DailyApple CEO Tim Cook waves as he attends a talk at Tsinghua University in Beijing October 23, 2014. Good morning! It’s going to be a rainy day in London. Here’s the tech news that you need to start off the week. 1. Apple has released a tool to deregister phone numbers from iMessage. That means you can switch to Android and continue to receive messages. 2. Poached Lyft executive Travis VanderZanden had been in talks to become the company’s CEO. He was hired by arch-rival Uber. 3. Some Apple stores are expected to open early on Black Friday. Doors will open at 8am. 4. Facebook has poached Google’s Director of Strategic Partnerships. He’s going to run global sales on Facebook’s Atlas platform. 6. BlackBerry says it is now focused on profitability rather than new devices. It has entered the second phase of its turnaround plan. 7. Apple’s lawyers claim the company “bent over backwards” to help its sapphire supplier. GT Advanced Technologies is filing for bankruptcy. 8. Uber has poached the man in charge of Google’s same-day delivery service. Uber is interested in making its own grocery delivery service. 9. Google abandoned its plans to create floating technology showrooms because of fire-safety concerns. Construction of the barges began in 2011. 10. Twitter is working with a women’s advocacy group to help fight harassment. The group will help review reports of abusive behaviour on the site.